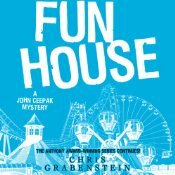 Given that FUN HOUSE is the latest release in a series I have come to love and pokes pokes fun at a modern phenomenon I despise, reality TV, I was probably destined to like the book. However I have been let down by destiny once or twice before so it wasn’t a sure thing but happily the book met all my expectations. And then some. It is the seventh book to feature former military policeman John Ceepak and his partner Danny Boyle who try to keep the fictional resort town of Sea Haven, New Jersey safe from the rather alarming number of criminals and murderers who frequent the place. It is summer again and the town has been been home to a new reality show which seems to be a hellish combination of all the reality shows ever to have aired, involving contestants who will do anything debasing for a few more minutes of ‘fame’, challenges designed to embarrass or titillate and voyeurism of the most puerile kind. On his night off Ceepak encounters several of the show’s contestants and is forced to arrest one of them. Footage of this event becomes an overnight You Tube sensation which results in Ceepak and Boyle being assigned to the show’s full time security detail, a ridiculous state of affairs that Ceepak only agrees to because it might lead to the apprehension of a drug dealer that has eluded the Sea Haven police for some time. As you might expect things don’t quite go according to plan and Ceepak and Danny are soon once again on the hunt for a killer. One of the standout features of this book (and its predecessors) is the two lead characters and their evolving relationship. They are almost unique for crime fighting blokes in that they are both basically well adjusted human beings, though John Ceepak does carry some deep scars from his time in Iraq and Danny might end up with his own nightmares if his body count keeps increasing. The fact that they are engaging people despite not being alcoholics, loners, depressives, mavericks or any of the other things that the men of crime fiction often are does make a nice change (and not for the first time makes me wonder if the other kind of character hasn’t been a little over done). I enjoy seeing a ‘normal’ male relationship being depicted and realised with this novel that the quoting of Springsteen lyrics at critical plot points has become a favourite feature for me and not only because I’m a fan. It serves the same purpose as quoting poetry does in more literary novels and is, I think, a particularly good observation about the way men (in this instance) can struggle to communicate their feelings. When Danny and Ceepak don’t know what to say to each other about the scary or emotional situations they find themselves in they can at least offer comfort to each other via the words of their favourite songwriter. Surely it beats the oft-depicted alcoholic binges as a way to deal with life’s difficult moments. Although it involves more than one gruesome death the plot of this novel is probably the lightest and funniest of the series though the deaths themselves are never treated too flippantly (at least not by Ceepak or Danny though some of the town’s political figures are a bit more cavalier). But the reality TV show setting offers Grabenstein many opportunities for poking fun at popular culture and he seems to relish the task. Even the normally taciturn Ceepak gets in on the act of ribbing the moronic behaviour of the contestants, the producers and the public who lap it all up. But while the book has lots of light moments Grabenstein does, as always, introduce some serious notes including the appalling fact that most policemen need to have second jobs in order to make ends meet financially (particularly poignant when juxtaposed with the ludicrous amounts of cash that ‘stars’ of reality TV might expect to make, especially if they are stupid, naked or a combination of the two). I like the way Grabenstein gently infuses his books with social commentary rather than ramming a point of view down reader’s throats. Grabenstein really has carved out a sub genre all of his own with this series or at least I can’t come up with anything to compare the books to. They’re generally light but not cosy (too much ‘on stage’ blood and violence and a lack of predictability), comedic but not really capers and blend the procedural with the satirical in unique way. As always I listened to this instalment narrated wonderfully by Jeff Woodman and my only disappointment is that I greedily gobbled the whole thing up in one day and now have a two-year wait for the next instalment of this series. Thanks as always to Belle for introducing me to this series (not only for this introduction but for the reminder that I don’t always know what I like because I never would have chosen the first book for myself). I have reviewed all but one of the earlier books in this series TILT A WHIRL, MAD MOUSE, WHACK A MOLE, HELL HOLE and ROLLING THUNDER (I have also read the fifth book MIND SCRAMBLER but somehow missed reviewing it – perhaps I’ll do a re-read when I’m jonesing for a Ceepak and Boyle fix while I wait for the next book). Oh and if you’re a fan of Ceepak and Boyle see if you can track down a copy of the short story RING TOSS which appeared in the June 2010 issue of Alfred Hitchcock Mystery Magazine and was at least in November last year available from Amazon as a kindle single (I couldn’t find it today though). This entry was posted in book review, Chris Grabenstein, USA. Bookmark the permalink. Bernadette – So nice to hear you liked this as well as you did! It’s always nice when a favourite series continues to stay excellent :-). I like this series too, and it’s not just because of the Springsteen lyrics (now if they were Billy Joel lyrics…. 😉 ). I think one of the best things about it is exactly what you point out – these are normal guys. They are refreshing free of personal demons. I’ve never heard of this series but I am interested…will put it on my wish list for later. Thanks. OT: Margot, love the new avatar! Sounds fun! Better than the reality TV satire I read recently, by Carolyn Parkhurst – reality had long ago eclipsed the satire in that case. I probably wouldn’t have chosen these books for myself, but they sound refreshingly good. I’m another person who cannot abide these so-called reality shows, which are about as far from reality as you can get. Thanks for the tip. Bernadette, thanks for this recommendation. I’ve just read all I could get on Kindle (Mind Scrambler does not appear to be available). I really enjoyed them, and especially appreciated the dryer than usual humour for an American book. It was also refreshing to come across such an unusual charater as Ceepak, his Code must make him the least existentially anxious character in the genre. The social commentary is biting, especially the reality show stuff, but throughout the series, it’s a lovely window on Jersey shore. Thanks again, it was just what I needed at this time. Thanks for leaving the comment Beth as it’s particularly nice to know that I’ve helped turn another person on to this gem of a series – I sometimes feel like a bit of an evangelist the way I go on about these books but I think they’re just so different from the usual stuff.. I love that notion of Ceepak being the least existentially anxious character in crime fiction – so true! But it just shows how nice blokes can be interesting too. In fact you’ve sparked an idea for a post….